PEG Ratio in Indian stock market can be a handy indicator to find undervalued stocks with good future growth potential. It is a better alternative to the Price to earnings ratio (PE ratio) to find winning stocks. In this post, we are going to discuss what is a PEG ratio and how to find good companies using PEG ratio in Indian stock market. The Problem with PE Ratio. If you’ve been involved in the market for a while, you might know that PE ratio is one of the most widely used ratios by the financial experts or investors. PE ratio refers to the price to earnings ratio. It is simply calculated by dividing the price per share of a company with its earnings per share (EPS). However, the biggest problem with the PE ratio is that it totally ignores the growth prospects of a company. Here, you might be able to find a good undervalued company. However, if the growth aspect of that company is not bright, then it might not be an amazing investment. Moreover, many times, finding undervalued companies based on just PE ratio leads to the value trap for the bargain investors. The value traps are those stocks which are ‘not’ cheap because the market has not realized their true potential or because of some temporary setbacks. These stocks are trading at a cheap valuation because the company has either lost its fire or else its fire is fading away. The investors who buy such stocks just by evaluating its low valuation falls in the value trap. PEG ratio or Price to Earnings to growth ratio is used to find the value of a stock by taking in consideration company’s earnings growth. In simple words, PEG Ratio is calculated by dividing PE ratio of a stock by its percentage EPS growth rate. PEG ratio in Indian stock market shows at what premium the stock price is trading with relative to its earnings growth performance. For example, suppose the price to earnings ratio (PE ratio) of a company is 20. And its earnings growth is 15% per year. As a thumb rule, companies with lower PEG ratio in Indian stock market should be preferred. For example, let’s assume there are two companies- Company A and company B in the same industry. if the PEG ratio of company A is 1.5 and PEG ratio of company B is 2.75, then company A should be preferred as it has a lower PEG ratio. Further, you should always compare the PEG ratio of the companies in the same industry. PEG ratios can vary from industry to industry as the growth rate of one industry may be faster than the other one. Anyways, a company with less than one PEG ratio in the Indian stock market can be considered decent. Quick Tip: Never make your investment decision based on just one factor. Although PEG ratio can give you an answer to how cheap or expensive is the stock concerning the rate at which its earnings are presently rising. However, it doesn’t tell you the whole picture of the company. 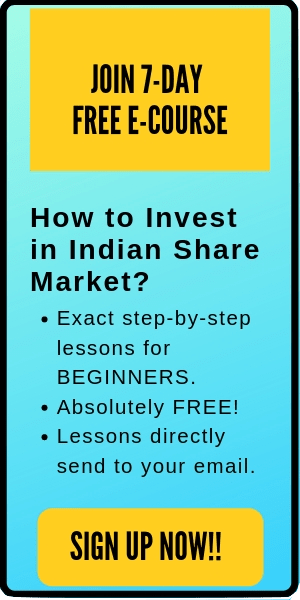 There are thousands of stock in the Indian stock market. Therefore using PEG ratio to shortlist few good companies to investigate further ones can be a good approach. 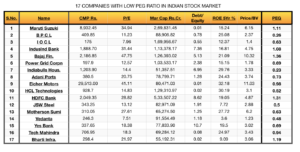 Here is the list of 17 companies with low PEG ratio in the Indian stock market. Quick NOTE: I have used an elementary filter to find these stocks. 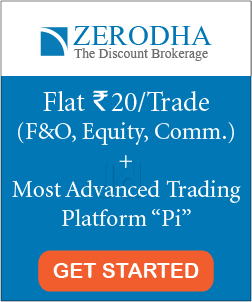 The stocks mentioned above has a market capitalization higher than Rs 50,000 crores and a PEG ratio between zero to 1.5. An important point to highlight here is that the large-cap companies generally have reached saturation and have a lower EPS growth compared to the mid and small-cap companies. However, if you can find a fundamentally strong large cap (which gives decent dividends) with low PEG ratio, then it’s a beautiful scenario for a value investor. 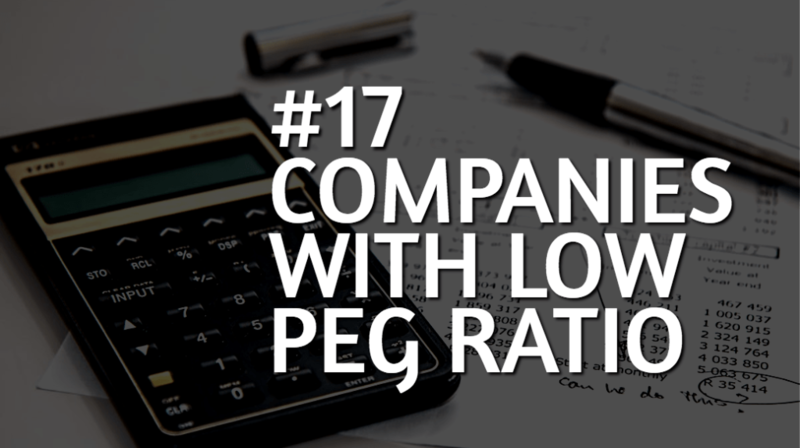 PEG ratio is a very powerful tool to find undervalued companies with keeping in mind its growth prospects. Many financial experts consider PEG ratio to be more helpful than PE Ratio and this topic is still controversial. However, for a smart investor- it doesn’t matters which one is better. The more important lesson here is how to use them to make an intelligent decision!! Also read: No-Nonsense way to use PE Ratio.